I have attached a photo of our GSD named Winchester. 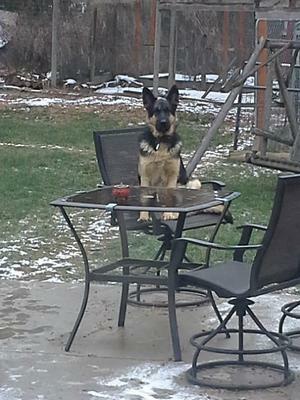 We were having our Thanksgiving dinner and Win decide he was missing His dinner. He loves rideing in the back of my work truck, on the hay trailer, and on the 4 wheeler. Our family has had many types of dogs over the years, but i believe Win is the best. You could not find a more loving, dependable, nicer looking animal. Thanks so much for taking the time to share the story of your wonderful German Shepherd, Winchester, with us all here. He is one great looking GSD, BTW!! He sounds like he has a wonderful life there with you on your farm - what a great place the world would be if every dog had a place to live like that. Way to go and I wish you all nothing but the best with him in the future. And if you get the chance to send us some more German Shepherd pictures and stories that you'd like to share, we'd all love to read those too. Handsome boy!!! Their first year, it's a tough one, our Mia, the puppy year, we went thru 4 patio umbrellas, a couple of doggies beds, 2 barbeque grill cover, chewed up plants etc, but I wouldn't trade that year with her for nothing, the bonding, teaching and training and the plus, holding her in my arms and close to my Heart and her licking my face!!! German Shepherds are an Amazing breed and soooo Protective, you'll see!!! Take care of you boy, Winchester and he will always take care of you!! !